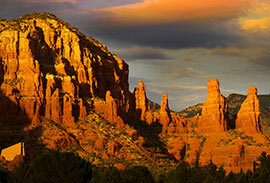 In a dynamic celebration of chamber music and musical education, the Third Annual Sedona Spring Music Festival will feature various events over four days, including school programs, a salon in a private home and a special concert featuring the acclaimed Fauré Piano Quartet. Since signing its first recording contract in 2006, the Fauré Piano Quartet has quickly established itself as one of the world’s preeminent piano quartets. Consisting of pianist Dirk Mommertz, violinist Erika Geldsetzer, violist Sascha Frombling and cellist Konstantin Heidrich, the group has earned a reputation as visionaries who challenge tradition. Specifically, they explore new sound fields in chamber music and perform classical works by timeless composers like Mozart and Brahms — as well as songs by pop artists like Steely Dan and Peter Gabriel. The quartet showcases its nonconventional approach with international tours, performing at some of the most distinguished chamber music venues in the world. When they are not on tour, the group’s members teach at universities in Germany and offer classes abroad. The Fauré Piano Quartet’s history has been studded with various prestigious awards and designations, including the ECHO Classic for its album Classic Beyond Borders.